The Queen Vic Market and a stroll along Southbank await before you go back to the ship. Discover the real Melbourne by walking its “laneways” and arcades. Start at historic Queen Victoria Market – “Queen Vic” – home to two full blocks of produce, meat, and seafood stalls, as well as handicrafts and souvenirs. Head to Degraves Street, a cobblestoned alley with great street art and cafés. For a coffee break, duck into Degraves Espresso Bar, or for fresh-squeezed juices, walk across the street to hole-in-the-wall Jungle Juice Bar at Centre Place. Eat lunch at casual MoVida, which serves delicious Spanish tapas and larger shared plates across the street from Federation Square. In Chinatown, Flower Drum’s elegant Cantonese has made it a Melbourne favorite for nearly 40 years. Don’t miss the National Gallery of Victoria. Its Ian Potter Centre at Federation Square displays the Australian art collection; for international exhibits (as well as the world’s largest stained-glass ceiling), take a short walk across the Yarra River to the original building. Stroll Southbank’s riverfront promenade to shop and relax with a glass of wine at one of its many cafés. 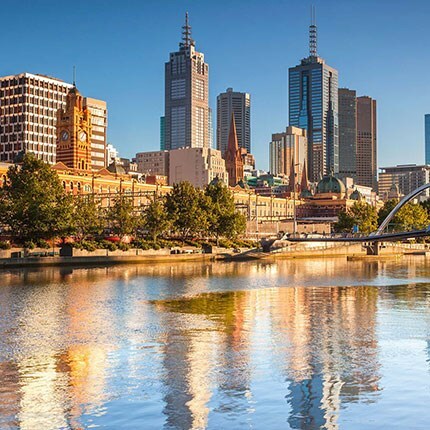 If you'd be interested in working with a Virtuoso advisor on a trip to Melbourne (or anywhere else), connect below. Many eventual Virtuoso travelers start out by worrying about cost, or relevance of advisors in 2015, or something else entirely. Read some real-life stories and see how they came around.